Originating from the 1955 Bandung Conference and established in Jakarta in 1963, the Afro-Asian Journalist Association (thereafter referred as “AAJA”) promoted international collaboration among left-leaning journalists in the newly independent countries. Its leadership, consisting of left-wing intellectuals in both Indonesia and abroad, strived to create a unified information domain for the entire Global South. Djawoto (1906–1992), the editor-in-chief of Antara, Indonesia’s national news agency, was elected as the AAJA’s first secretary general. In 1964, Indonesian President Sukarno appointed Djawoto as the ambassador to China and Mongolia and Joesef Isak (1928–2009) took over. Lionel Morrison (1935–2016), the South Africa-born journalist who was once put on trial together with Nelson Mandela due to his resistance against the Apartheid regime, was a member of the Permanent Secretariat and played a prominent role in the AAJA’s flagship publication, an English-language monthly magazine entitled Afro-Asian Journalist. Active participants included Mamadou Gologo (1924–2009), a literary-minded Malian government minister and physician, Asrar Ahmad (1923–2012), a founder of the Pakistan Federal Union of Journalists, and Mamani Abdoulaye (1932–1993), an itinerant poet for the cause of Pan-African unity sometimes referred as “the Che Guevara of Niger.” They all attended the inaugural conference of the AAJA held in Jakarta in February 1963 and became contributors to the magazine Afro-Asian Journalist. Image 1. Cover of the Afro-Asian Journalist, volume 4, 1964. This diversity helped to explain how the AAJA remained comparatively liberal as Sukarno tightened his control over domestic politics while steering the archipelago towards militant anti-imperialism in foreign policy. In 1959, Sukarno replaced constitutional democracy with the more authoritarian system of “Guided Democracy.” Meanwhile, by launching the policy of konfrontasi against the formation of Malaysia, Sukarno antagonized the US and its allies while bringing Indonesia closely to China. Yet unlike state-controlled media in countries under communist party rule, the AAJA advocated a school of what I would call “socialist cosmopolitan journalism,” characterized by an idealistic vision of synchronized and connected world revolutions as well as commercial awareness, cultural pluralism and artistic vibrancy. This socialist cosmopolitanism was expressed through the contents as well as the artwork and design of the magazine Afro-Asian Journalist. Its editors believed that the main purpose of the AAJA was to form a base camp for progressive journalists to hone their professional skills in the battle against the presumably profit-driven, sensation-mongering capitalist press. Socialist journalism was still a trade subject to commercial competition in an open market. Morrison, in particular, urged leftwing journalists to think of ways to attract and entertain their readers by providing a nutritious but also easily digestible intellectual diet for the general masses. Visual art, in this regard, could convey ideas and emotions that did not require high degree of education on the part of its audience. A key feature of Afro-Asian Journalist was its extensive use of images, including photos and political caricatures. 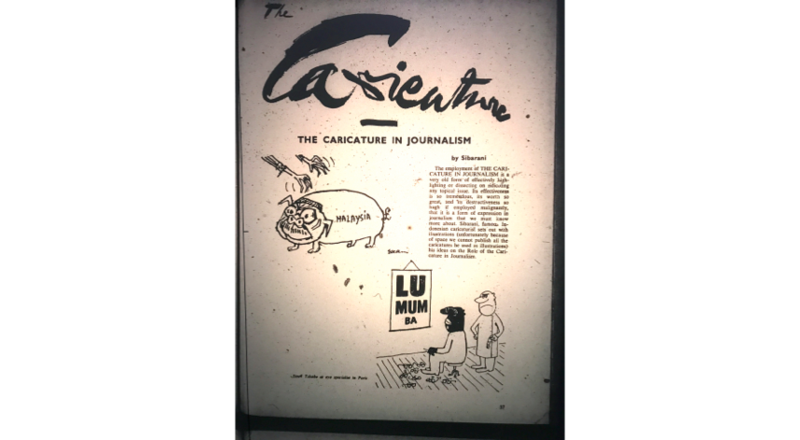 Satire and humor, in the words of Indonesian painter and cartoonist Sibarani (1925–2014), can be a tremendously effective and hugely destructive political weapon. Image 2. Sibarani, “The Caricature in Journalism,” Afro-Asian Journalist, Issue 7, 1964. Afro-Asian Journalist’s editorial staff did not seem to distinguish among texts, photos and caricatures, considering all as art. 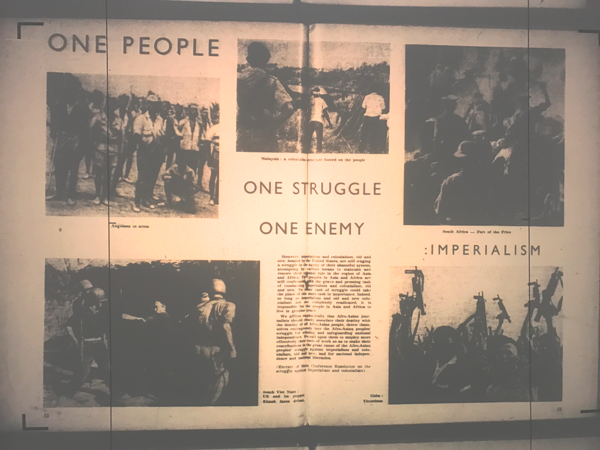 Contents of its articles were thematically standardized to highlight the singularity of worldwide battles against imperialism, while text was often arranged alongside images to create a visual effect of synchronized world revolutions and uniformity of people’s struggles around the globe. One prominent example was the signature center spread that appeared in all issues of Afro-Asian Journalist except for the inaugural one. It juxtaposed pictures of militant resistance against colonial, imperialism and neocolonialism across different parts of the world, stimulating its readers to visualize the political solidarity and temporal simultaneity among these spatially distant struggles. Image 4. 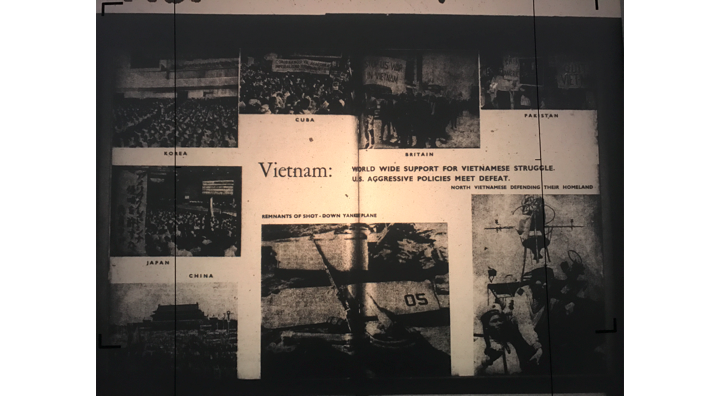 Center spread, Afro-Asian Journalist, Issue 5, 1964, featuring “World Wide support for Vietnamese Struggle,” with pictures demonstrating how “the US aggressions meet defeat” in Korea, Japan, China, Britain, North Vietnam and Cuba. Image 6. 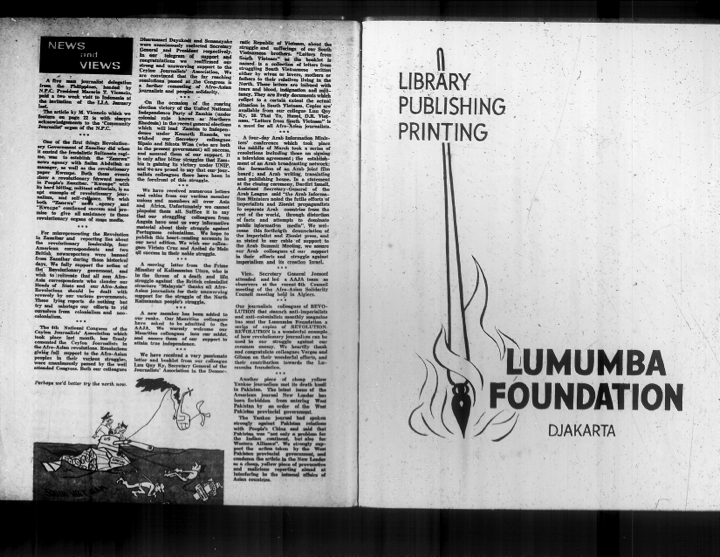 “News and Views” and the logo of Lumumba Foundation, Afro-Asian Journalist, Issue 2, 1964. On the inside of Afro-Asian Journalist’s cover pages were advertisements for three of its sisterly magazines: Revolution, “an indispensable illustrated monthly with worldwide coverage of people’s’ movements and revolutions” based in Paris, France; Progressive Review, a “national democratic” bimonthly magazine championing Afro-Asian solidarity, anti-imperialism and anti-colonialism based in Manila, the Philippines; and The Spark, a “pan-African, revolutionary journal dedicated to the struggle for the total liberation and absolute unity of Africa” headquartered in Accra, Ghana. Each volume execept the first one contained a column named “News and Views,” a collection of reports on global affairs from leftwing newspapers in Asia and Africa, including both state-owned propaganda machines such as the People’s Daily from China and Rodong Shimoon from North Korea and non-governmental newspapers such as Ludu of Burma, Indonesia’s Bintang Timur, Singapore Barisan Weekly, Ghanaian Times, Pakistan Observer and Dawn, Himaichuli of Nepal, L’Essor of Mali, Le Peuple of Algeria, Nigerian Morning Post, and Al-Massa of Egypt. The reports were selected to form an interplay of echoing narratives along coherent themes, creating an image of robut transnational information flow centered on common struggles against imperialism. The AAJA was short lived in Indonesia. The 1965 regime change and the ensuing violent nation-wide anti-communist campaign shattered the apparatus of the AAJA, with its staff members either persecuted in Indonesia or forced into exile overseas. Joesef Isak was detained without trial by the Suharto regime for ten years and started to fight for press freedom once he was released. In the 1980s, Joesef Isak directed the publication and translation of Pramoedya Ananta Toer’s Buru Quartet, probably the most renowned literature work of modern Indonesia in the world. Djawoto, on the other hand, attempted to resurrect the AAJA under the protective wings of Beijing. But the stifling atmosphere of the Cultural Revolution (1966–1976) proved unbearable for the Indonesian journalists who yearned for political freedom. Ironically, in the 1970s and 1980s, the transnational networks previously forged by the AAJA in the name of anti-imperialism became the platform that facilitated the migration of the Indonesian leftwing journalists from China to the capitalist West. 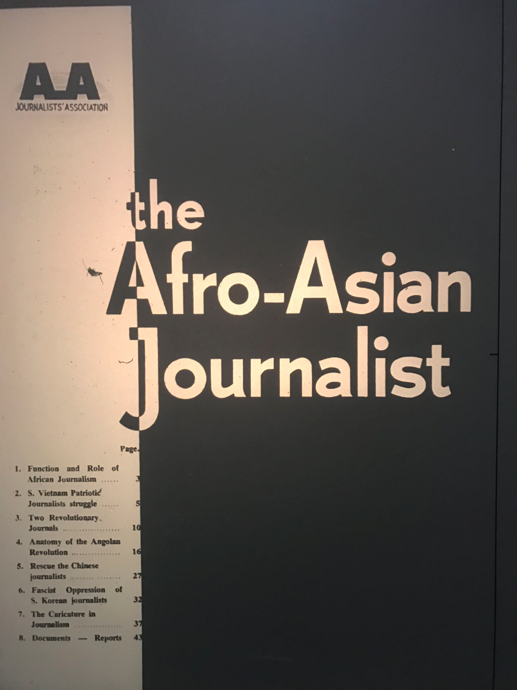 The AAJA’s dissolution reflects the heterogeneities of the Afro-Asian world and the fragility endemic to a transnational journalistic project that was multilingual and multifaceted. Yet its brief history could help us gain new understandings of the Third World in the Cold War in terms of its global information networks, lively intellectual traffic and rich visual culture.